Self-aligning ball bearings are double-row roller bearings of the series 12 and 22 (DIN 630) and are made up of an inner race with two ball raceways and an outer race with a concave-shaped raceway. This makes angular movement possible which can be used to compensate tilting, shaft bending or misalignment. Modern self-aligning ball bearings are also supplied maintenance-free (for normal applications) with seals on both sides and a "for life" grease filling. On account of the design, the permissible angle movement of sealed self-aligning ball bearings is reduced from 4° to a maximum of 1.5°. Alongside self-aligning ball bearings with cylindrical bore, tapered bores (with a K added to the product designation) with a bore taper 1:12 are also often used. In addition, self-aligning ball bearings with a widened inner race (series 112 or 113) are also available. 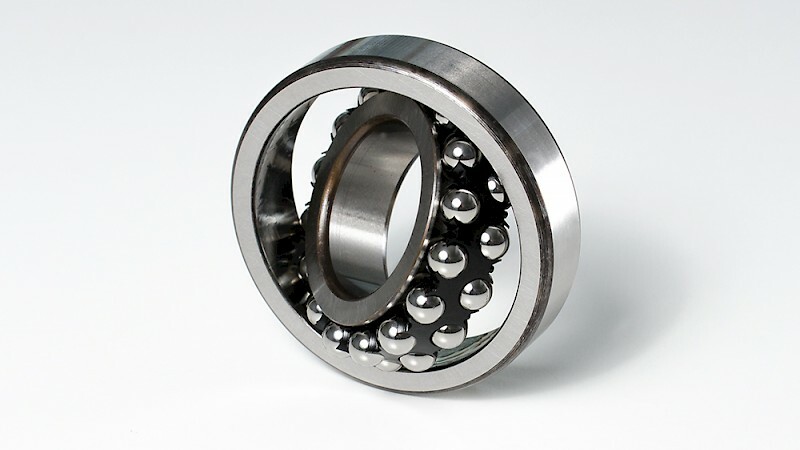 The specialists at Wälzlagertechnik have a wide range of experience at their disposal for the optimum selection of self-aligning ball bearing design, lubrication and sealing, so that the bearings can be optimised in terms of price, performance and service life for specific customer applications.